3-star-hotel in the 6th district of Budapest. Address: 1068 Budapest, Benczur u. 35. The hotel has 154 rooms. Hotel Benczur is situated in the heart of Budapest, next to Andrassy Street in the diplomatic region. In spite of the central location our hotel is a small, green island in the middle of a peaceful garden area, far away from the noise of the city. 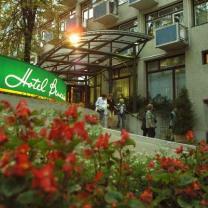 Hotel Benczur is situated in the heart of Budapest, in the diplomatic region. In spite of the noisy central location our hotel is a small, green island, in the middle of a peaceful garden area far away from the noise of the city. It is combined with the all over the world mentioned hungarian hospitality, that is guaranteed by the well-trained staff. We await our guests with 154 quality, comfortable double bedrooms with bathrooms. 24 of the rooms are air-conditioned. All rooms are equipped with color televisions,telephones and minibars for your comfort. Our restaurant is extremely popular amongst guests, thanks to our highly praised and appreciated cuisine and pleasant terrace, which operates in the summertime and in good weather. We offer traditional Hungarian dishes and international culinary specialities. If you stay at our hotel, you don't have to leave your favourite animal at home. In our hotel the animals are "guests", too. Just 2 minutes from Heroes' Square we are waiting for you and the people, who would like to discover the magic of the "Benczur world"!